Yvonne Pont, a native British Columbian, enjoyed a long career in the airline industry. Her love of travel and writing culminated in the creation of her debut novel, “The Bess Time”, and now her second novel, “Nick of Time”. She is currently writing “ ’Tis About Time”, the third book of this trilogy in the “Christmas In Time” series. “Christmas In Time” Series is a Christmas journey. The series begins in the twenty-first century, travels back to the mid-nineteenth century and then continues into the twentieth century. Each novel in the series features it’s own particular Christmas In Time. A number of years ago, I wrote an assignment titled “I —- Writer” for my creative writing course. Jane Austen was a writer. Charles Dickens, Sir Arthur Conan Doyle and Agatha Christie were writers. The difference is, they are all famous and unfortunately quite dead. Being famous and dead doesn’t cut it for me, at least for the next forty years. Albeit, I could live with the famous part of the equation. Time is marching on. To fulfil my dreams, I had to stop daydreaming and put my thoughts to paper. It’s not that the hand guiding the pen hadn’t had lots of practice over the years. There had been innumerable reports for the car club’s newsletter, (very creative ones, if I do say so) unorthodox minutes leaving the members in stitches, and handwritten Christmas letters created especially for the individual reader. Of course, I must not forget school days, when many a story, poem or play produced substance for the hungry eyes of the teacher. In fact, one such story saw print in the high school newspaper. Thanks to my husband, Alec, for suggesting I take creative writing courses, thus giving me a well needed push in the right direction. Thanks to my teacher, Ed, for opening the flood gates to allow the creative juices to flow once more. On February 17, 2009, I penned the words “The Bess Time” on a piece of paper. From that day on, I graduated to full page after page of handwritten words. With dedication beyond my wildest thoughts, I transcribed my worn and tattered scribble into an electronic device (foreign to me) called a computer. 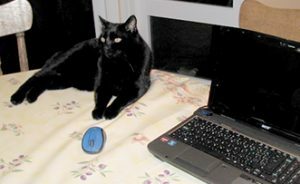 My veins gorging with an uncontrollable flow of writer’s mania, I found myself perched in front of a laptop. My hand fused to its keyboard, we became inseparable. We took ferry rides; unaware of rough or calm waters as our course focused on writing. We flew to Hawaii; exposing our bodies to X-ray and security scrutiny. 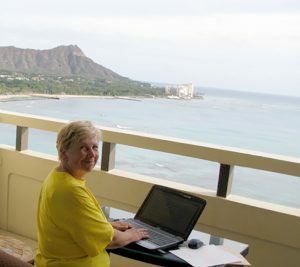 We recovered from the dramatic invasion by composing ourselves on the lanai, overlooking the tropical surf. But, mostly we sat on or around the kitchen table like old friends and created our masterpiece. On February 17, 2011, I completed my first novel. Now I could honestly say, ‘I am a writer.’ On November 18, 2013, “The Bess Time” showed up at my front door; all 252 beautifully printed copies, perfectly bound in a sparkling laminate finish. What happened between 2011 and 2013 you might ask. As all writers know, getting your book published, especially your debut novel, is a true test of perseverance and determination. I learned much more than I ever imagined about the publishing industry. Hopefully it would be much easier the second time around. The knowledge and experience I gained in the writing of “The Bess Time” certainly helped to produce “Nick Of Time” , my second novel. However, it took two years longer than anticipated. Although the creative juices never stopped flowing, life kept getting in the way. Finally on November 16, 2017, the first 100 books arrived.